For these nails I used Clear Straight Forward nail tips from Magnetic, pink glitter from So Nails, pink acrylic powder and acrylic liquid from Star nails. First I stuck the tips on and cut them. Then using a little acrylic powder and liquid as a binding agent, I applied the glitter to the nail tips. After the design was done I covered my entire nail with acrylic powder and liquid. So pink is no longer my favorite color (its now purple btw) , but I still <3 pink! Pink is my favourite color! I gotta love these!!! 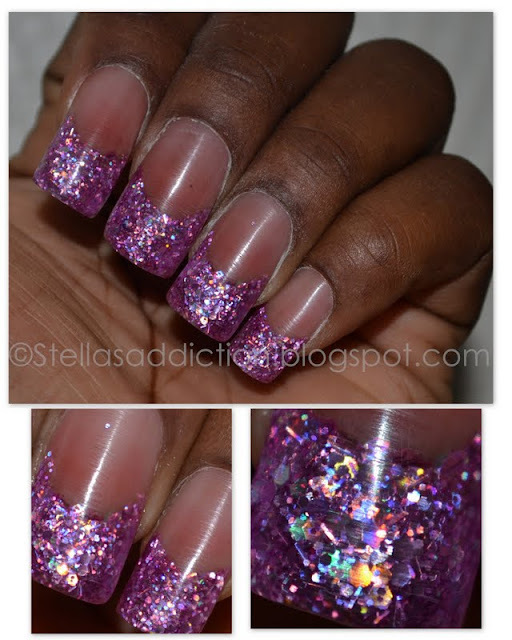 !I wish I could reproduce it on my own nails! I'm now ffg your blog. Somewhat off topic: Have you tried Revlon's Expressionist collection? They have a polish called Facets of Fuschia that looks like a close dupe of Deborah Lippman's Bad Romance.